Quick and easy afternoon crafts are something we love to do. Especially when the weather is nice and the kids are eager to get outside. 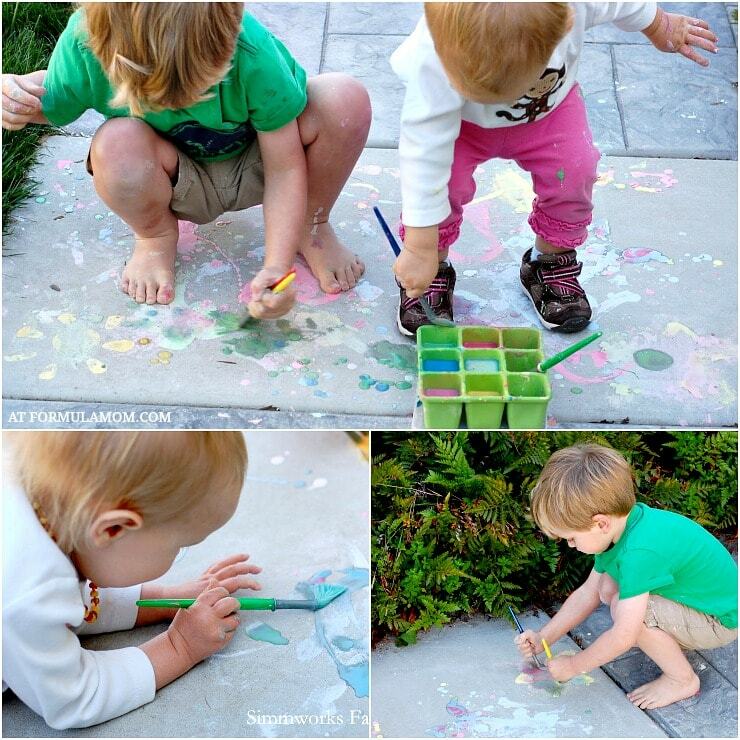 This DIY Sidewalk Paint craft is not only fun for the kids but it’s easy to put together and very inexpensive. There are only three components to this paint: water, corn starch, and food coloring. You can’t get any simpler than that. An added bonus with this activity is the fact that both of my children could partake in this activity. She jumped right in as soon as she saw the brushes and didn’t stop until it started getting cold out. 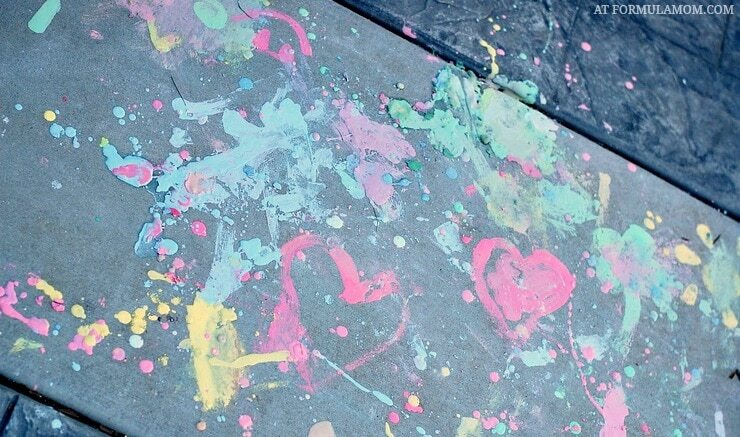 I love how creative and imaginative both of them can be together with just paint and a sidewalk. 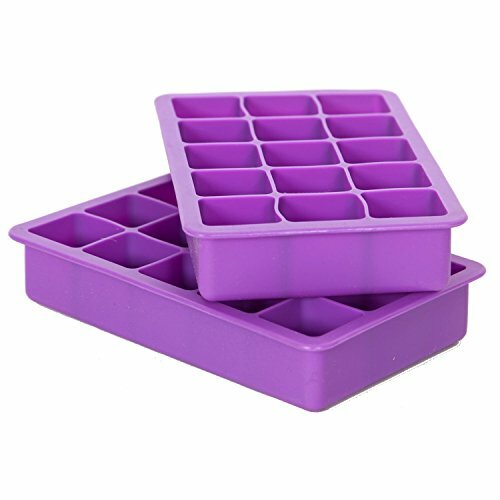 The materials are pretty basic and we’ve included our affiliate links in case you need to order anything! Mix equal parts corn starch into equal parts water. We started with 1 cup each. Pour cornstarch mixture into containers. 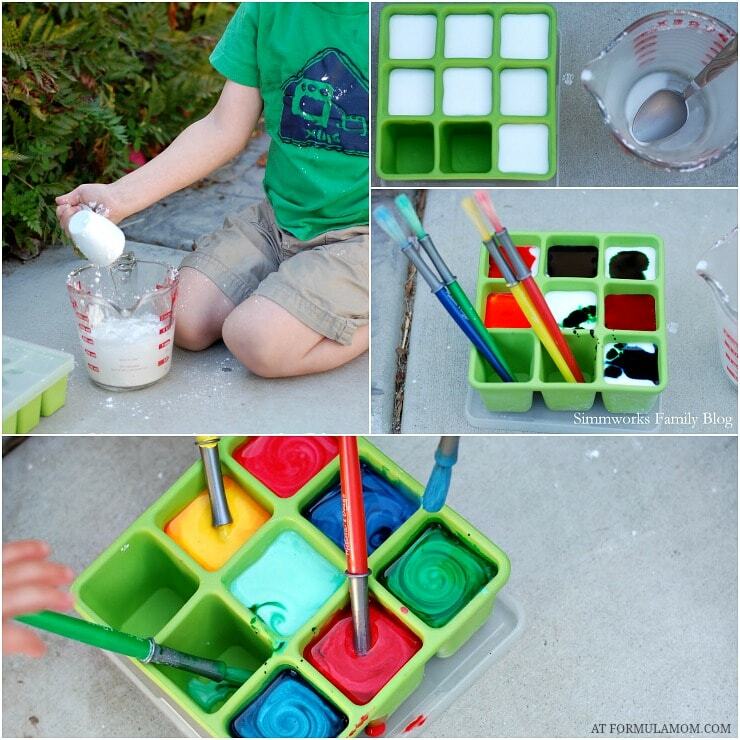 Add a few drops of food coloring into each different container. Note: We used this activity as a tool to work on colors. We started with the basic primary colors, blue, red, & yellow, and then decided to get creative and mix them to create more colors. 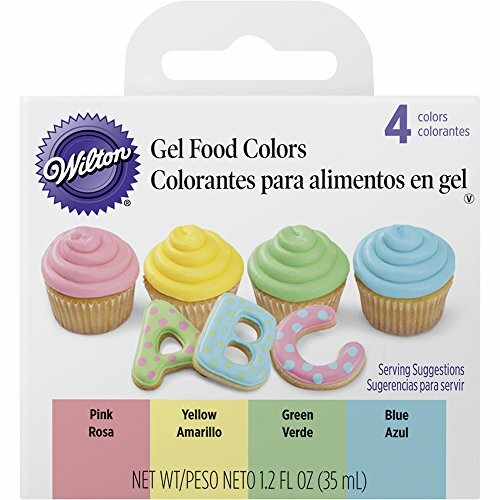 Let your child swirl and mix the food coloring into the corn starch mixture. The corn starch can thicken at the bottom so make sure to stir well and stir often. Dip your paint brushes in and start having fun! This activity is not just for your preschooler. Infants and toddlers love it as well! My 15 month old daughter had a blast painting with her brother. She even wanted to share with mommy and tried to paint me and the camera a few times. I outlined shapes and asked my son to color them in. He also helped draw circles and squares for his sister to fill in. Depending on how many layers of paint you put down you will get a slightly raised effect that makes the artwork look even cooler than regular sidewalk chalk. Please note: Some food coloring may dye or stain your sidewalk. Always test on a small area and let dry before moving on to larger areas of sidewalk. Our artwork did not stain our sidewalk and we left it overnight. I’m sure if we waited longer there might have been light staining. That is so neat! I have to try this with my daughter! What a great ideal! Thanks for sharing! Neat, my grandchildren will love this. Wow THIS IS THE BEST IDEA EVER!! lOVE IT! 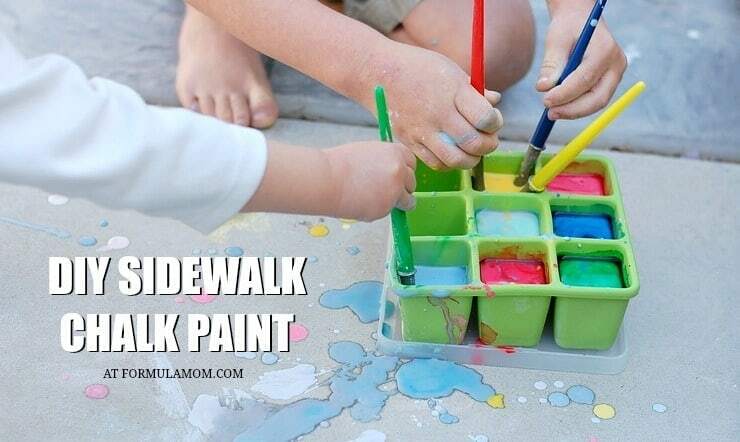 We can’t paint our sidewalk, but thanks for sharing a quick and easy way to make paint. 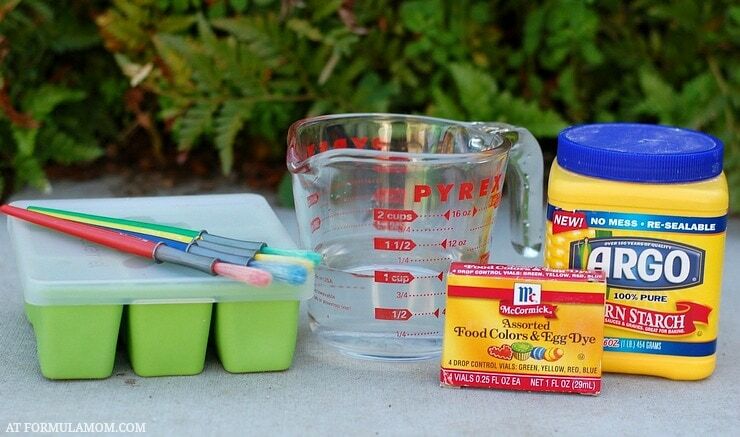 Water-based paint may be safer to add to the mixture than food coloring…I will try this, this weekend. Thanks! 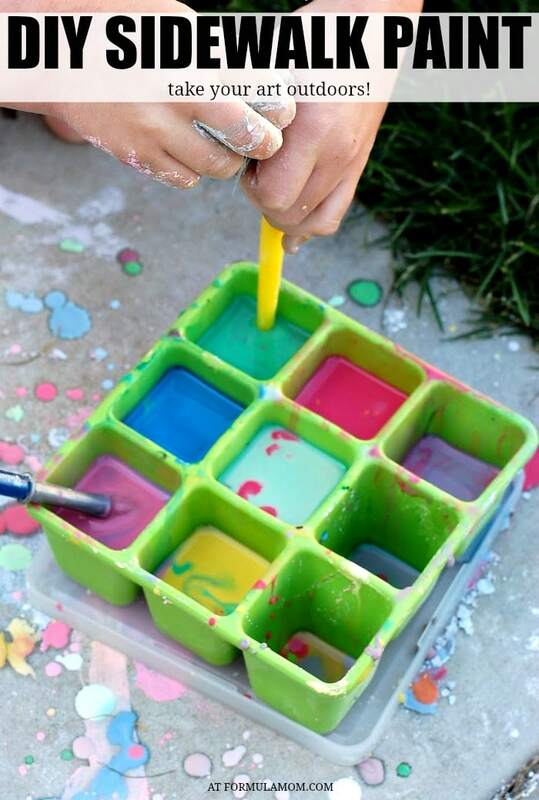 I saw a clever idea for summer with these homemade chalks: freeze them in ice cube trays! I thought it was a great idea to add to an already great idea! Thanks for sharing! Great i have all the ingredients for this! Now if the rain would go away!